There is going to be a sale. A SALE! At Seasons Gift Shop. Run, get there as quickly as you can. It begins Aug. 1 and goes throughout the month. This is big…very, very big! 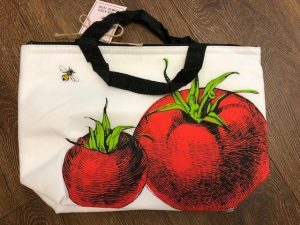 One of the most popular items, and especially great for the back-to-school college kids and high school girls is the vegetable thermal lunch bag. 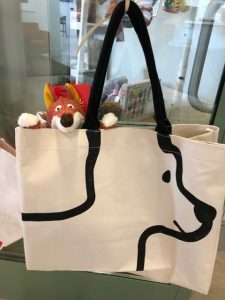 It comes in a tomato, carrot, and radish design and each feature a crisp white bag with black handles. There are also matching ceramic serving pieces that are the best! And for taking care of leftovers, think of the coordinating silicone lid by Charles Viancin. And, an adorable new kerchief is in town, all dressed and ready to take home. The lovely handkerchief is folded as a dress on a drawn model and has a lovely invitation to use the hanky “to cover a sneeze.” Victorian in style, you can hold it close to heart as the new season of Victoria returns to PBS this fall! There are lovely shawls and necklaces, bags and baubles for the ladies to peruse, as well as, a host of manly things for the guys. An especially wonderful set of jewelry has been designed for our church family. The pieces are from Windsor Gallery Jewelers and are silver cast likenesses of our church and the St. Johns’ cross. There is a Luther Rose cast as well. For our guys, there are ties, bill clips, shoeshine gear, paperweights and books, as well as, beer openers in creative masculine shapes. For home décor, look for the heart cross wall hanging. It is stunning as a modern expression of an ancient expression of love and sacrifice. Another decorative, but useful item is the Fair Trade hand basket woven in village co-ops in Ghana, West Africa. They are colorful, useful, and attractive for display. And finally, for the family beasts, don’t forget the WONDERDUL doggie bags that have ear handles! It’s the cutest thing to gather attention on a walk with your companion. Get ready to shop! The sale runs the whole month of August, Tuesdays– Thursdays, 10:30 am—1:30 pm and Sundays, 9-11 am.